The building is really impressive, and after registration I wanted to meet also the other guys who came to the event. I saw a lot of volunteers working around the booth and immediately thought that co-hosting the conference with GNOME.Asia was a very good idea, because it made the event much bigger. After the Welcome Speech and a short overview of GNOME 3.12 held by Tobias Mueller, it was the turn of Jaroslav's and Jiri's Fedora Keynote. There were a lot of people who weren't contributors, so talking about Fedora.next was not very easy for them, but I think they presented it the right way and I really enjoyed it. Once the Keynotes finished I went to another room where Nitesh talked about Fedora Videos. The talk was interesting although I already saw his talk at FLOCK in 2013. After Nitesh it was my turn, I talked about Fedora Websites, what the websites team does and how the sites work. I explained also the build process and Internationalization, trying to keep the discussion as easy as possible to involve also the non-contributors who were listening. At the end I talked about the changes due to Fedora.next and showed some screenshots of how the Fedora websites will probably look like. People seemed very impressed and I was somewhat happy they appreciated the work we are doing. In the afternoon I listened to Aditya's talk about Ansible and Zamir Sun's brief introduction to firewalld. The last two talks I wanted to hear were in chinese, so I jumped from one to the others and finished with the lightning talks. In the evening we went to a nice place near the University, therefore many young people were there and we had a lot of fun. The Steps Bar had probably the biggest pizza in Beijing, some nice Chicken Burgers and obviously....a lot of beer (the glass in the foto contains 3 liters)!!! Evening was short, we had to catch the last subway, but I was also very tired. The morning was all dedicated to two important talks, the first one about Systemd, the second about Computing, Freedom and Privacy. Lennart Poettering did a generic talk about what systemd is and added some practical examples, he also kept his talk easly to understand for everyone. After a short break and some lightning talks it was the turn of Richard Stallman, it's always nice to hear him speaking about free software. In the afternoon I helped Ankur during his GPG key signing workshop, as the half of the attendees hadn't even a key or were using other operating systems...we had a lot of fun during this session and it's true that a GPG key signing party is a cool social event. Once finished we all went to the main room for the closing speech and the group foto. It was a big event because it was co-hosted, maybe it's a good idea to do the same also in the future, because not only organisators did a great work, but the whole event benefited from this. After the closing of day 2 we went to the near Vision Hotel, where we had a great dinner. From noodles, to rice dishes, hotpot and Beijing duck, all you wanted to eat was there. It was really a very good ending dinner of one of the best FUDCons of the last years. For me Beijing lasted another 2 days, I did some sightseeing in the next days and enjoyed the local meals and chinese friendliness. Hopefully I can return to Beijing soon, I liked it very much! It happened all at the last moment, I decided to attend FUDCon APAC a lot after the official deadline, dropped an email to the organizers and as there were only a few days left before the event, I had to put together all my papers to obtain the visa for China. I decided to stay in another hotel, still quite good but less expensive, because I would have been reimbursed only partially for the flight. The problem was...I was not able to find it! Obviously I tried to ask but people were not really able to help me. The decision to print the address of my hotel in chinese turned out a very wise thought. At the end, and after more than 2 hours, a nice chinese girl accompanied me to the hotel and gave me also her business card. She was my salvation! After I checked in I had the whole day to discover this amazing city, so I took a shower and went to the center. Distances are quite big and I had to learn this first, but chinese people are very helpful, and although they often are not able to understand, they try to help you in every situation. I decided to visit the Lama Temple (Yonghe Gong) and it was quite impressive, it's not a very big place but I enjoyed this temple. The big buddha statue, 18 m high, is a must when you come to Beijing. My first lunch in Beijing also was very curious, I discovered a small place were a lot of chinese people was eating, so it was a promising place. I asked for the menu and got it after seconds, but it was only in chinese...never mind I thought, and indeed a chinese guy who also spoke a bit of english asked if he could order for me and I let him do so. What I got was a spicy soup and a good and cold Tsingtao beer, 25CYN were ok and after it I returned to the hotel, because I wanted to relax a bit before FUDPub. The first social event also means the start of every FUDCon, so I moved to the 雕刻时光, (Sculpture in Time Cafè), where I met some of the other Fedora guys and GNOME folks. Jiri, Jaroslav, Ankur, Alick, Nitesh, Somvannda were only a few, there was also Emily, who heads the GNOME stuff, Tobias from Germany and Lennart Poettering. The evening was really good, we had pizza and rice with meat. Almost all of us wanted a beer, but unfortunately they had only a warm one...no problem, after FUDPub we took also a couple of well cooled beers in the hotel at 3CYN (!!!). Subways in Beijing close at 23:00, so the evening was a bit short, but I was also very tired and I fell in the bed exhausted, looking forward to the first day of FUDCon APAC. 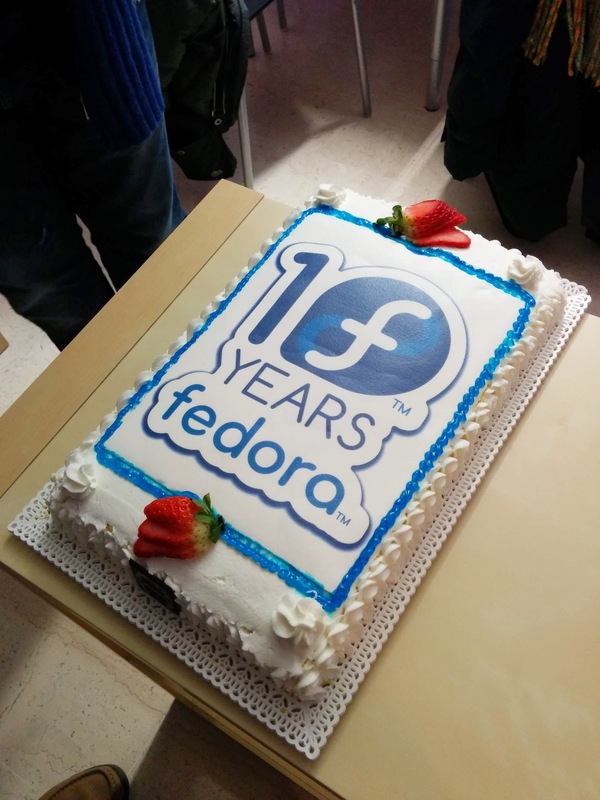 Last Saturday we held a Fedora 20 release party in Perugia (Italy). This time, I decided to use my own office space to host the party, even if the furniture is not 100% complete (release early!) so I could determine whether I can use it again (release often!) for other parties/courses. This had pro and cons, but overall I am very happy with the results. Since I was not really sure who would join me, I had ready a couple slide decks: the generic introduction to the project, and another one about Fedora.Next (based on the Flock slides from +Matthew Miller). As I mostly expected, the Fedora.Next topic was where I spent most of the time: I received many questions and comments about the plan, and people looked very interested and eager to know more details (which unfortunately I had not, since everything is still in early stages). However, I will probably redo it next week at the traditional Linux Night dinner the local LUG organizes monthly. 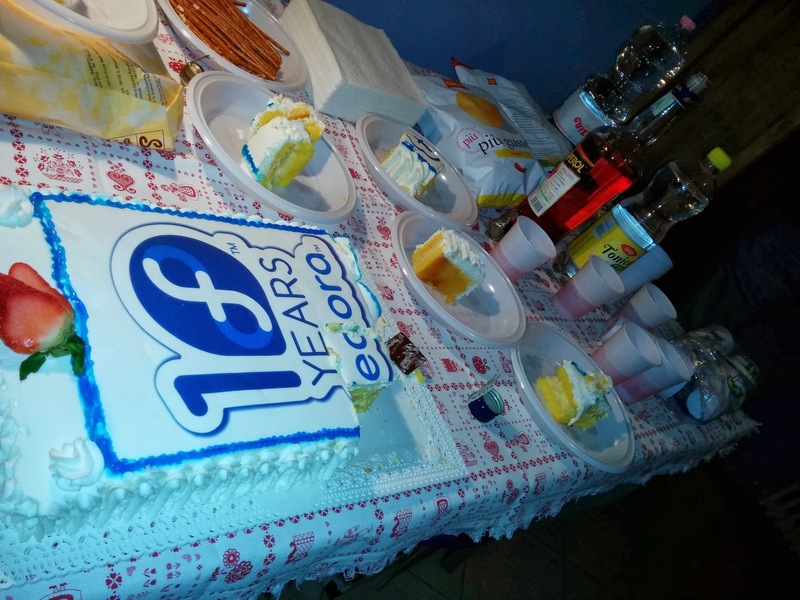 As usual, I would like to thank the Fedora Project for sponsoring the party, and everyone that joined me to celebrate another great Fedora release. È un po' che non pubblico nulla sul blog, visto che di questi tempi la maggior parte delle mie farneticazioni su Linux e dintorni si sono spostate in Google+. Mi fa quindi molto piacere tornare a scrivere per segnalare che il prossimo 18 Gennaio alle 16.30 faremo un bel party a Perugia per festeggiare il recente rilascio di Fedora 20. Ovviamente, se avete qualche idea per un tema da trattare, accetto suggerimenti! Per regolarmi sulla quantità di cibo/bevande per favore fatemi sapere, nei commenti oppure sulla pagina Google+ dell'evento, se pensate di partecipare.